The WindeX WD goosenecks for ventilation on board ships are the perfect solution for the supply and extraction of air for various technical areas on board vessels. The product line includes goosenecks for natural and mechanical ventilation. The models with mechanical ventilation include a ventilator integrated directly in the pipe. The WindeX WD Goosenecks are manufactured in our own manufacturing facilities and are available in a wide range of models. We can offer standard models but generally design our goosenecks to order. • All sizes and diameters possible, such as two meters above deck according to classification or trimmed. The WD Goosenecks include a bulge so that they can be easily welded to the deck. 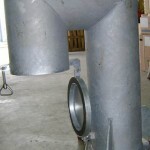 Another option is to include a weld flange. The gooseneck can be sealed with a flap and clamp that also serves as a fire flap!